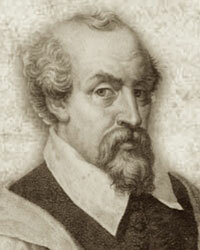 Member of a mercantile family, he was born in Genoa in 1559. His father wanted him to become a doctor, and he studied medicine first in Padua and then in Rome. He obtained his degree in 1581 in Genoa. He then went back to Rome where he quickly became personal doctor to the relatives of the Pope. He also served in the Compagnia del S.S. Sacramento. He was papal archiatra during the brief reign of Urban VII, from September 14th to September 27th 1590. He lived in Rome forty years, and died there in 1625. 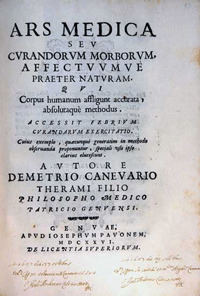 He wrote several works of natural philosophy and medicine, among them there the Instituta medicinalia, the De rerum naturalium ortu atque interitu commentarium (1583), the De ligno sancto commentarium (1602) and the works published posthumously by his heirs, according to his will, the Ars medica and the De primis rerum natura factarum principiis. His writings are focused on the Aristotelian principles of ‘matter’ and ‘form’, and in particular on the efficient agent. The author of these works was not at ease with the new astronomical theories, which he did not share, and was indifferent to the anatomical discoveries which undermined Aristotelian-galenic physiology. His approach to illness was generalized. Even the De ligno sancto has an Aristotelian backbone. In this work Canevari offers his opinion of guaiaco or holy wood, employed to heal syphilis. Like Fracanziano, Fernel, Massa, Mattioli, and against Brasavola, Lobellius, Falloppio and Gallo, he believed that only guaiaco from Santo Domingo could be considered genuine. Bibliography: Catalogo del Fondo Canevari della Biblioteca Berio di Genova, a cu­ra di R. Savelli, Firenze, La Nuova Italia 1974; A. De Ferrari, Canevari (Canevaro), Demetrio, in Dizionario Biografico degli Italiani, vol. 18 (1975); Dizionario Biografico dei Liguri, vol. II, Genova, Consulta ligure 1994, ad vocem a cura di A. Lercari; R. Savelli, La "libraria" di Demetrio Canevari, in Da teso­ri privati a bene pubblico. Le collezioni antiche della Biblioteca Berio di Genova, Pisa, Pacini 1998, pp. 91-106; L. Malfatto, E. Ferro (a cura di), Biblioteca civica Berio, Saperi e meraviglie: tradizione e nuove scienze nella libraria del medico genovese Demetrio Canevari, Genova, Sagep libri & comunicazione 2004; V. Tigrino, L’Archivio Storico dell’Opera Pia “Sussidio Canevari Demetrio”: introduzione storica e inventario, in «La Berio», XLVIII (2008), n. 1, pp. 62-96. 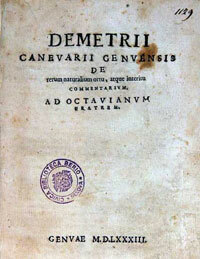 Demetrio Canevari established in his will (1623), and several later codicils (1625) that his library had to be transferred after his death from Rome to Genoa, together with the manuscript catalogue that he had compiled (Index librorum om­nium qui in nostra bibliotheca certis pluteis continentur). In 1630, the library was moved to Genoa in 48 boxes, and entrusted until the 1750s to the male lineage of the Canevari family (in 1639 it was in the house of his brother Ottaviano, in contrada Lercari, on 12 new shelves; the year after was moved to the Villa of Multedo). In 1754, the library was donated to the Jesuits, and the when the Society of Jesus was suppressed in 1773, it was given to the Padri Somaschi. In 1810 the library was returned to the Canevaris, then again to the Jesuits (1844-1848) and to the Padri Somaschi. In 1868 it was returned to the Canevaris yet again, and was kept in via Lomellini. It contained 1820 volumes. In 1930, the library was entrusted to the city of Genoa, and placed in the Biblioteca Lercari. In 1962, the city bought the collection outright and moved it again to the Biblioteca Berio. Demetrio Canevari left his library – about 3,000 volumes, mainly on scientific subjects – to his family. Because of several relocations, the library is no longer in its original condition. Though it was probably not damaged during the bombardment of the city in 1684, it was looted during the Napoleonic period, like many other religious institutions. Furthermore, Demetrio's brother Ottaviano added a group of legal texts to the original nucleus of the library, and it is possible that other additions were made. In 1933, Amedeo Pescio counted 1820 volumes, while the editions described in the Savelli catalogue (1972) are 2431. Today the library includes 110 incunables, 1898 sixteenth century editions, and 423 editions printed between 1601 and 1625. A reproduction of the manuscript catalogue can be found here: e-corpus.